As so often, the Shark Divers have started a thread and I would like to pick it up as follows. Fair Trade in Tourism South Africa is a respectable institution and their Trademark, a coveted distinction for Tourism operators of that country. Among many other things, it implies that the people whose land, natural resources, labour, knowledge and culture are used for Tourism activities, actually benefit from Tourism. Look now further than the Shark Reef Marine Reserve Project with its holistic approach to Conservation. FTTA have decided to look into Shark Tourism in South Africa and have published this important position paper on the matter. Before I unleash, let me categorically state that it is a good one: balanced, fair, unbiased, pragmatic, it explores the full scope of the issues at hand and draws the right conclusions. 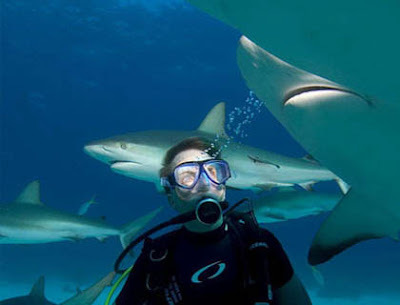 FTTA are the first ones to admit that they are no experts in Shark Tourism and carefully avoid taking any positions with respect to the usual controversies. This of course is the way it should be and they need to be commended for that approach. And yet, the usual allegations raise their ugly head unchallenged. Let me try and sum up the current state of affairs, at least how most of us in the Shark Diving Industry see it. Yes I've already blogged about it but if left unanswered, these allegations will, and have already developed into Urban Legends, and then, the "Truth". It's all about memetic Evolution - check it out, fascinating. But first, lets get rid of the question whether Shark diving increases the risk of Shark incidents. And so does swimming, surfing, spear fishing, whatever! The simple reason for that is that Shark incidents have one precondition: Sharks and people have to be in the same place at the same time, that place being the Ocean. Equally obvious is the fact that there will be some correlation between the number of people frequenting the Sea and the number of incidents - thus, any increase in people implies an increase in risk. This is so trivial, it is painful! Well, how about looking at the airline industry: aviation increases the risk of plane crashes (Hellooo.....). Confronted with such mind-boggling insights, do we run and close down the industry? Or, do we instead require that commercial airline operators conform to the strictest safety procedures possible? This is precisely what has to be asked from us. And let me re-iterate that safety procedures will always remain species- and situation-specific and will always imply a judgment call by the operator. Now, to the actual debate, this in order of increasing complexity. Yes, many of us do use bait to attract the Sharks. Although Shark diving in unbaited conditions is certainly possible, predictable encounters can only be expected where the species are resident (or maybe, territorial) - as in Grey Reefs and Silvertips; or, where the lay of the land, or special conditions aggregate the Sharks - as on the sea mounts in the eastern Pacific, during the yearly congregations of Whale Sharks in the Caribbean and Australia or at the cleaning stations of Thresher Sharks in the Philippines. Other than that, one is left to the vagaries of chance encounters : great when conducting coral dives but just not quite good enough to justify mounting a commercial operation specifically targeting Sharks. The issue this raises is that of Conditioning. By that, one implies that luring in the Sharks will change their behavior - well, again, Yes........... Why otherwise would we bother doing it? The natural behavior of most Sharks is not to approach divers unless specifically motivated to do so - and that's precisely what we are trying to achieve, to motivate them. Incidentally, in our specific case, we also try to condition our Sharks to follow a uniform and largely predictable routine and to stay away from the clients. Were I a Shark hugger, I would immediately object that letting the Sharks waste precious energy on fruitless "hunts" is to be rejected as it is likely harmful to the animals. But of course, that would be totally besides the point - the point being that common wisdom has it that this will prevent the Sharks from associating humans with food via so-called positive reinforcement. We shall come on to that later. Apparently, according to the FTTA paper (and news to me), some quarters even contend that just teasing, but never feeding the Sharks could even be regarded as negative conditioning: the frustrated animals will learn to avoid those situations. Sound plausible to you? Would the cage divers use that technique and bother to schlepp along all that bait if they believed it would eventually chase away the Sharks? Leaves Conditioning via Positive Reinforcement, the big no-no. Yes, I confess, this is precisely what we do! We reward the Sharks whenever they approach, very much in the hopes that over time, more and more of them will turn up for a meal - which of course, being smart Apex Predators, they do! We do so in order to show them to our clients - as opposed to, as I shall never tire to repeat, Fishermen who do exactly the same thing in order to catch and then kill them. Get the hint? Who has the way biggest, and most negative impact on the animals? Are we going to abolish fishing as a consequence? I wish! But now, the saga continues: apparently, feeding the Sharks teaches them to associate humans with food. It is never said expressis verbis, but the subliminal message is that the so conditioned Sharks will not only associate, no, they will learn to regard humans as food and then start devouring anybody chancing to enter the waters they live in. All intuitively plausible - but is it really so? I'm a dyed-in-the-wool Darwinist, so please allow me to cite the Great Man himself: "Vox populi, vox Dei, as every philosopher knows, cannot be trusted in science." If we disregard the bait which is clearly the primary attractant and conditioning factor, is it not fair to assume that the strongest conditioning factor may well be the engine noise? Is it not so that some operators have learned to rev up the boat engines to "ring the dinner bell", and this with great success? And if so, So What? The "what" apparently is this. This kind of signal, or even the mere presence of humans, are supposed to trigger a Pavlovian reflex: the Sharks will become excited, motivated and hungry and this will precipitate the abovementioned nefarious consequences, especially when no food is being offered. And this is precisely the very point where Intuition is leading to Conjecture and Myth. Nothing whatsoever, not the objective data about Shark incidents on, or in the vicinity of Shark feeding locations, nor the collective subjective perceptions of all Shark Diving Operators I've ever talked to supports in any way those allegations. This despite the fact that one would expect precisely that to happen, as a result of an increase of potential encounters and thus, risk - remember the first trivial argument? To make an example, what we experience on our Shark Dive is this. When we get to Shark Reef, we start by baiting the surface where the Trevallies, Rainbow Runners and Bohars (but never any Shark!) will hit the bait and, we believe, attract the Sharks to the resulting commotion. Upon getting into the water, we may, or may not, see some of our non-resident (at least not at the depth and location where we feed) animals: Tiger Sharks, Bull Sharks, Lemon Sharks and Nurse Sharks. Have they been attracted by the engine noise? By the action at the surface? By us entering the water? Or did they just happen to be there anyway? Frankly, we don't know - yet. But we're working on it. During the dive, the numbers of Sharks will increase as we continue feeding the big fish and later, the Sharks themselves. But once we decide to stop the feeding, the Sharks will retreat and disappear within minutes - not get frustrated and attack us in retaliation. This after close to ten years of positive reinforcement. And when we go to Shark Reef without food, some Sharks may turn up for a quick cursory flyby but then disappear, never to be seen again. Mind you, the above is merely our perception. Interestingly enough, having once taken along an anti-feeding advocate and scientist, these very same observations did not dispel, but instead reinforce her reservations. As always, perceptions turn out to be highly subjective. This can only be resolved by proper scientific research. To the readers in general: watch this space! To the colleagues amongst you. Guys, we're in this together. This nonsense threatens all of us and needs to be stopped. We have the resources, animals, locations and opportunities enabling us to collect the relevant data. This may cost us some time and money, and we may well end up with answers we don't like - but if so, we will learn something new, as we should always be willing , and eager to do. And we will get even better and safer in the process. Let's do it - it's the only way forward. That's a whole lotta debate you got going there. All of it good and necessary. Nice post.